Rivenshore is a small village set in an isolated valley that lies south of an ancient and sometimes dangerous world. It's surrounded on three sides by wilderness that leads to the Forbidden Highlands mountain range, and on the southwest side sits the Choral Beck river. The mountains and river both protect and isolate Rivenshore. The entire area is simply known as The Valley. Beyond the mountains to the north lies what is known to the people of Rivenshore as The Great Realm. To the south, beyond the falls, is another village known as Fairfall, which is also part of The Valley at large. A smaller mountain range known as Bear Cliffs separates the two villages. giant waterfall, Rivenshore sees few traders. The traders they do see mostly come from the north down the river. Although it appears that the river ends at the waterfall there is also a cut off to the east. Those traders who know the way travel the river south past Rivenshore and then follow it to the east where the river escapes The Valley through a narrow passage only large enough for small trading boats. The traders by land are usually from Fairfall. 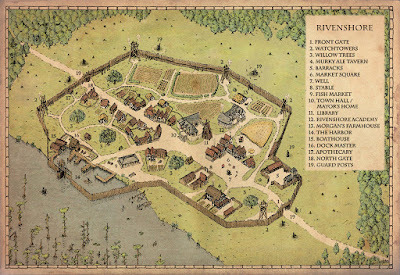 Rivenshore has been in commerce with Fairfall almost from the beginning. Traders make their way along the eastern pass which runs along the mountain. It's the safest route between the two villages. To those travelers whose business brings them by Rivenshore, the village is known for it's hospitality, a fine marketplace and as a great place to get freshly cut lumber for any boat repairs that might be needed. 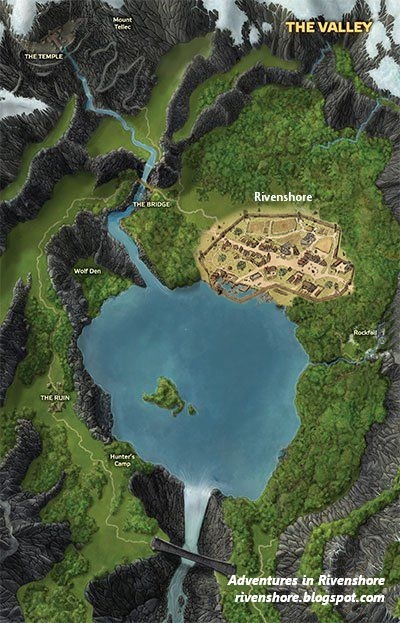 Rivenshore is also known to be home to several races - humans, elves, halflings and even a handful of gnomes. There's also a dwarf named Hastreath Grayhelm who stopped for a rest while traveling south to the dwarven town of Hordohr. That was over twenty years ago, and Grayhelm wasn't the first traveler through the centuries to get lost enroute to one place or another, and wind up settling in this valley by the water fall. What began a few hundred years ago as a small fishing camp set up by a few humans and elves who were tired of fighting the wars in the north, grew into a diverse village of peaceful people. As peaceful as life is in Rivenshore there are plenty of dangers outside of the village that can make their way down the mountain, through the forest or down the river. The two biggest threats to the village are wolves and bandits. Although most of the traders are peaceful folk, there are bandits that find their way to The Valley and foolishly see the people of Rivenshore as easy marks. Up the northwestern passage that crosses the river there is the Wolf Den. It was discovered over two-hundred years ago when the then tiny village had no fence for protection and only a few skilled warriors, rogues or mages among them. The village was attacked by a pack of wolves. The next day some of the surviving townsfolk tracked the wolves up the northwestern pass, over the river then down the western pass to their den. On the west side of the river they were greatly outnumbered by what they assumed were demon wolves with red eyes. They made a quick retreat back home. There have been no wolf attacks on Rivenshore since. Rumors abound as to what exactly is to the west, but all those who have traveled there have never returned. The western pass is no longer used. Not long after the wolf attack the watchtowers were built, and eventually the fence that walls the entire village in. It was also the beginning of the tradition of all townsfolk being trained in basic defense from a young age. For the last hundred years those with an adventurous spirit and a sense of duty to their home receive advanced training at the Rivenshore Academy. At the academy young men and women specialize in different fields, learning the tools and techniques of warriors, rogues, and even mages - for those who have a predisposition for magic. They train and practice daily, even venturing out to the forest and up the mountain for survival training. They also help around the town when needed. Throughout their academy training cadets may be called upon by Guard Captain Jack Harker or Sheriff Ira Skeen to help with situations that may arise, such as the recent infestation of giant rats in the tunnels below The Murky Ale Tavern. These small tasks help build the cadets skills so that when they graduate they will be ready for the much larger adventures to come. Graduates split duties between becoming adventurers - bringing back goods and treasures not readily available in the small village - and joining the Town Guard which is run by the Guard Captain. There are nine guard posts strategically placed outside of the fence surrounding the village. In their second year, cadets become part of the guard post rotation.